Welcome! Below are a few pointers to ensure you truly enjoy your first experience with us. Please arrive 10 minutes before class to meet your instructor, inform her of any physical limitations, and let her know that this is your first Pilates class. Your one-on-one session with an instructor will be 55 minutes. During this time, your instructor will customize an individual routine of the Pilates exercises. You will also learn the basic principles of Pilates (breath, postural alignment, connection to core muscles) and receive an introduction to the Pilates Reformer machine with basic beginning exercises. Please wear comfortable clothes that you can move in and not feel restricted in any way. We recommend Yoga-style pants and tops that expose your shoulders to allow for full range of motion. Please no zipper or belts. Please refrain from wearing jewelry or perfumes. Bring a clean pair of socks. Our clients exercise in socks and we recommend toe socks and/or socks with grips on the sole of the foot. If you do not have this type of sock, you can purchase them from us. Please bring a water bottle and a hand towel. Filtered water is available. We encourage all of our clients to create an account on-line and pay for their first set of 5 Pilates Classes via credit card. Pilates at our studio are not like going to the gym. Exercises are performed with conscious awareness of your movements and positions with focus on your body and its present state. Come to your session with intent on focusing on you and your body only. Please arrive 10 minutes before class to meet your instructor, inform her of any physical limitations, let her know that this is your first Yoga class, and find a spot for your mat in order to feel comfortable in our Yoga studio. Wear comfortable clothes that you can move in and not feel restricted. 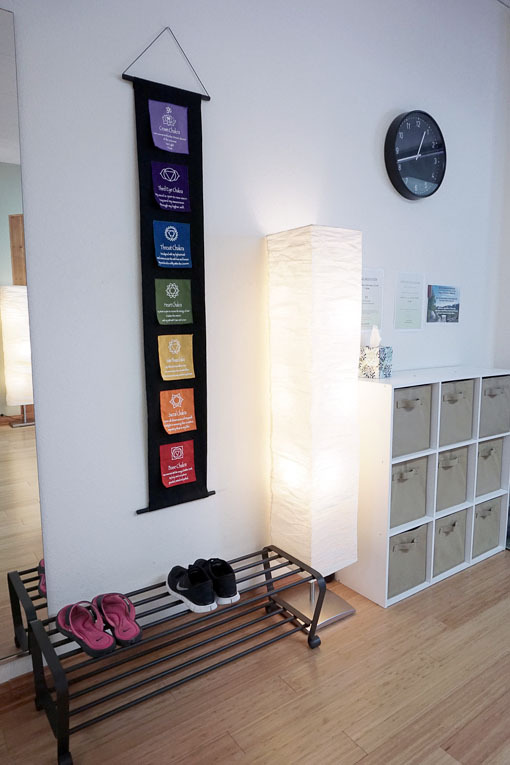 Most clients practice yoga in bare feet, but you are welcome to wear socks. We recommend toe socks and/or socks with grips on the sole of the foot. Please refrain from wearing jewelry and perfume. Yoga at our studio is not like going to the gym. Exercises are performed with conscious awareness of your movement, and a focus on your body. We work hard to leave the outside world behind and focus on being present. Come to your Yoga class with this type of intent and we believe you’ll get the most out of your class.